Today we are pleased to present our sixth annual list of information technology companies where young people should start their careers. We publish this list because it is our responsibility as a financial advisor to provide the advice that maximizes your net worth. As proud as we are of our financial planning and investment services, we think we can add even more value by helping you start your career on the right foot. Choosing the right job can add far more to your ultimate net worth than making good planning or investment decisions. We believe the companies we list each year are the ideal places for young people to start their careers because they are all highly likely to turn into large businesses, and nothing early in your career is more important than achieving success — and nothing signals success more than working for a successful company. For a complete explanation of this logic, it’s important that you read the post that accompanied our original list. We built our list by surveying partners of the following 13 premier venture capital firms: Accel Partners, Andreessen Horowitz, Benchmark, DAG Ventures, Greylock Partners, Index Ventures, Lightspeed, Kleiner Perkins Caufield & Byers, Matrix Partners, Ribbit Capital, Sequoia Capital, Social Capital and Spark Capital. As always we may have missed a few companies, but we feel confident that our list is pretty all-encompassing. Once again, a smaller percentage than you might expect of the new additions (43%) were consumer companies. A much lower percentage than last year of the new additions are based in the Bay Area (54% vs. 79%). Only 32% of the new Bay Area companies are located south of San Francisco (the traditional Silicon Valley), which is well below last year’s 50%. After a one year pause, San Francisco is back to gaining share. New York had a strong showing with 8 new additions, which is a much higher percentage than it has represented in the past. The number of IPOs remained very low at only 5, consistent with last year’s all time low of 2. There were also very few company sales. Finally, we had a very small number of drops from the list due to slowing growth relative to previous years. 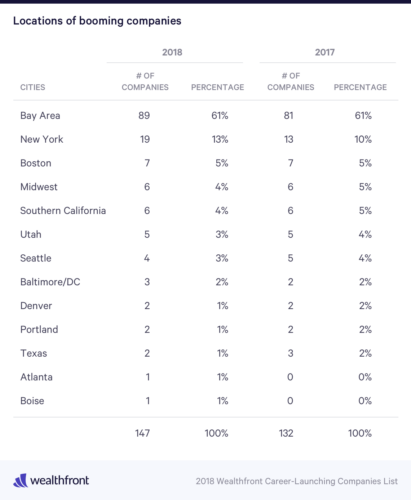 As usual, the majority of the companies are based in the San Francisco Bay Area (61%) and the Bay Area maintained its share from last year. The majority of the Bay Area companies (67%) are still located in San Francisco rather than Silicon Valley, and for the first time in three years, San Francisco gained share and is now close to its peak of 70% in 2015. No geography other than New York gained share this past year. While other geographies may be experiencing an increased level of startup activity, it still appears that the more successful companies are likely to be based near Silicon Valley. This means you should seriously consider moving to the Bay Area to launch your career and consider moving home to start your own company once you’ve gained the halo and experience. Enterprise gained share to 65% of the companies, up slightly from 64% last year, continuing the long-term trend. Only 5 of the Bay Area consumer-focused companies are not headquartered in San Francisco, but that’s up slightly from only 3 last year. People who want to work for a consumer facing company on the Peninsula may need to look for slightly earlier stage companies. There are now only two hardware companies left on the list, and one of them is a toy company! This is amazing when you consider that Silicon Valley was built by semiconductor and hardware companies. Oh, and one more thing. 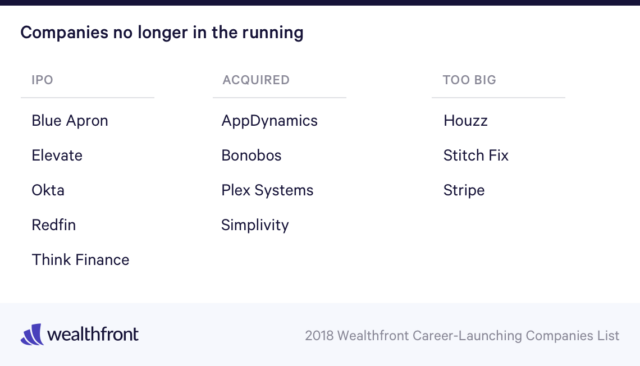 This is the first year that Wealthfront qualifies for the list. We received many questions over the years regarding why we were not included. Our simple answer is that we have to live by the same objective criteria as everyone else. Fortunately, this is the year we finally made it. We couldn’t have done it without the support of our amazing clients. We hope you find this year’s list helpful. If you are an engineer, we provide slightly different advice, which can be found on our engineering blog. No matter what your background, we believe this list can help young professionals looking to rapidly grow their careers. And once you’ve achieved some success, we hope you will consider using Wealthfront as your financial advisor.